Lungs can supply blood stem cells and also produce platelets: Lungs, known primarily for breathing, play a previously unrecognized role in blood production, with more than half of the platelets in a mouse’s circulation produced there. Furthermore, a previously unknown pool of blood stem cells has been identified that is capable of restoring blood production when bone marrow stem cells are depleted. A new drug for multiple sclerosis: A new multiple sclerosis (MS) drug, which grew out of the work of UCSF (University of California, San Francisco) neurologist was approved by the FDA. Ocrelizumab, the first drug to reflect current scientific understanding of MS, was approved to treat both relapsing-remitting MS and primary progressive MS. Marijuana legalized – research needed on therapeutic possibilities and negative effects: Recreational marijuana will be legal in California starting in January, and that has brought a renewed urgency to seek out more information on the drug’s health effects, both positive and negative. UCSF scientists recognize marijuana’s contradictory status: the drug has proven therapeutic uses, but it can also lead to tremendous public health problems. Source of autism discovered: In a finding that could help unlock the fundamental mysteries about how events early in brain development lead to autism, researchers traced how distinct sets of genetic defects in a single neuronal protein can lead to either epilepsy in infancy or to autism spectrum disorders in predictable ways. Protein found in diet responsible for inflammation in brain: Ketogenic diets, characterized by extreme low-carbohydrate, high-fat regimens are known to benefit people with epilepsy and other neurological illnesses by lowering inflammation in the brain. UCSF researchers discovered the previously undiscovered mechanism by which a low-carbohydrate diet reduces inflammation in the brain. Importantly, the team identified a pivotal protein that links the diet to inflammatory genes, which, if blocked, could mirror the anti-inflammatory effects of ketogenic diets. Learning and memory failure due to brain injury is now restorable by drug: In a finding that holds promise for treating people with traumatic brain injury, an experimental drug, ISRIB (integrated stress response inhibitor), completely reversed severe learning and memory impairments caused by traumatic brain injury in mice. The groundbreaking finding revealed that the drug fully restored the ability to learn and remember in the brain-injured mice even when the animals were initially treated as long as a month after injury. Regulatory T cells induce stem cells for promoting hair growth: In a finding that could impact baldness, researchers found that regulatory T cells, a type of immune cell generally associated with controlling inflammation, directly trigger stem cells in the skin to promote healthy hair growth. An experiment with mice revealed that without these immune cells as partners, stem cells cannot regenerate hair follicles, leading to baldness. More intake of good fat is also bad: Liberal consumption of good fat (monounsaturated fat) – found in olive oil and avocados – may lead to fatty liver disease, a risk factor for metabolic disorders like type 2 diabetes and hypertension. Eating the fat in combination with high starch content was found to cause the most severe fatty liver disease in mice. Chemical toxicity in almost every daily use products: Unregulated chemicals are increasingly prevalent in products people use every day, and that rise matches a concurrent rise in health conditions like cancers and childhood diseases, Thus, researcher in UCSF is working to understand the environment’s role – including exposure to chemicals – in health conditions. Cytomegalovirus found as common factor for diabetes and heart disease in young women: Cytomegalovirus is associated with risk factors for type 2 diabetes and heart disease in women younger than 50. Women of normal weight who were infected with the typically asymptomatic cytomegalovirus, or CMV, were more likely to have metabolic syndrome. Surprisingly, the reverse was found in those with extreme obesity. via TAK 733 » All About Drugs. Type 2 diabetes mellitus (T2DM) is a chronic disease, which is affecting widespread populations in epidemic proportions across the globe 1. It is characterised by hyperglycemia, which if not controlled adequately, eventually leads to microvascular and metabolic complications (Fig 1). Traditionally, T2DM management includes alteration in lifestyle, oral hypoglycemic agents and/or insulin. The present pharmacological approaches predominantly target glucose metabolism by compensating for reduction in insulin secretion and/or insulin action. However, these approaches are often limited by inadequate glucose control and the the possibility of severe adverse effects such as hypoglycemia, weight gain, nausea, and sometimes lactic acidosis 2–4 (Fig 1). Hence the search for new drugs with different mechanism of action and with little side affects is key in providing better glycemic control in T2DM patients and hence offering better prognosis with reduced morbidity and mortality. 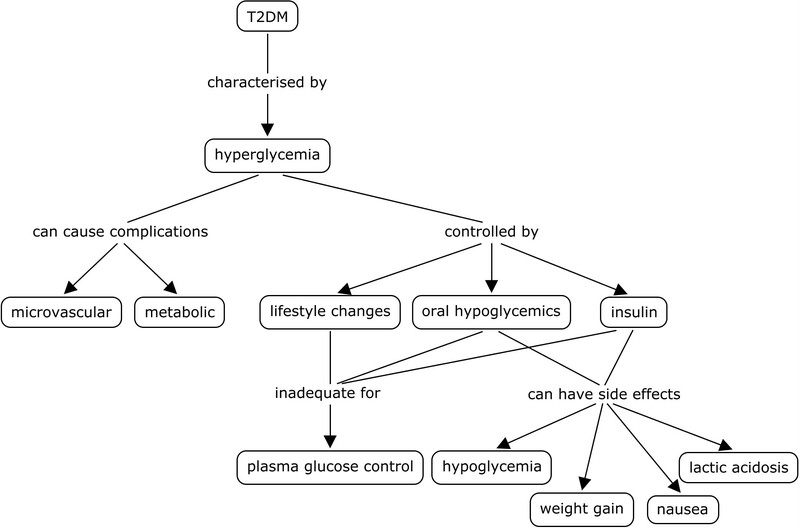 Figure 1 (credit: aviral vatsa): Short overview of Type 2 diabetes mellitus (T2DM): complications, present therapeutic approaches and their limitations. Along with pancreas, our kidneys play a vital role in regulating glucose levels in the plasma. Under physiological conditions, kidneys absorb 99% of the plasma glucose filtered through the renal glomeruli tubules. Majority i.e. 80-90% of this renal glucose resorbtion is mediated via the sodium glucose co-transporter 2 (SGLT2) 5,6. SGLT2 is a high-capacity low-affinity transporter that is mainly located in the proximal segment S1 of the proximal convoluted tubule 6. Inhibition of SGLT2 activity can thus induce glucosuria which inturn can lower blood glucose levels without targeting insulin resistance and insulin secretion pathways of glucose modulation (Fig 2). Figure 2 (credit: aviral vatsa): Schematic overview of regulation of plasma glucose by sodium glucose co-transporter (SGLT). Thus inhibition of SGLT2 provides a novel way to modulate blood glucose levels and consequently limit long term complications of hyperglycemia 7,8. 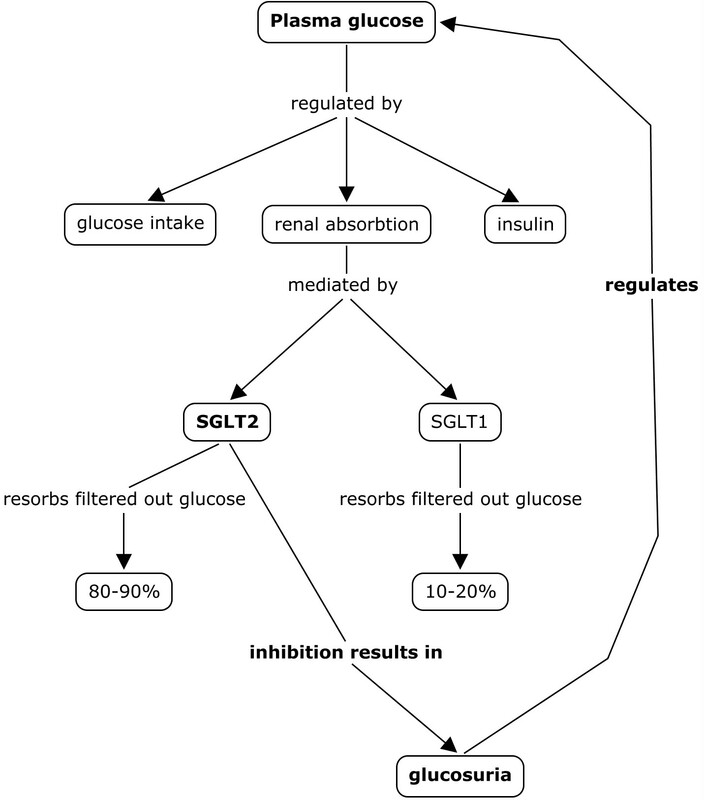 Moreover, SGLT2 inhibitors will selectively target the renal glucose transportation and spare the counter regulatory hormones involved in glucose metabolism because SGLT2 is almost exclusively located in the kidneys. This novel way of glucose modulation will likely avoid severe side affects, e.g. hypoglycemia and weight gain, that are seen with present antidiabetic pharmacological agents. 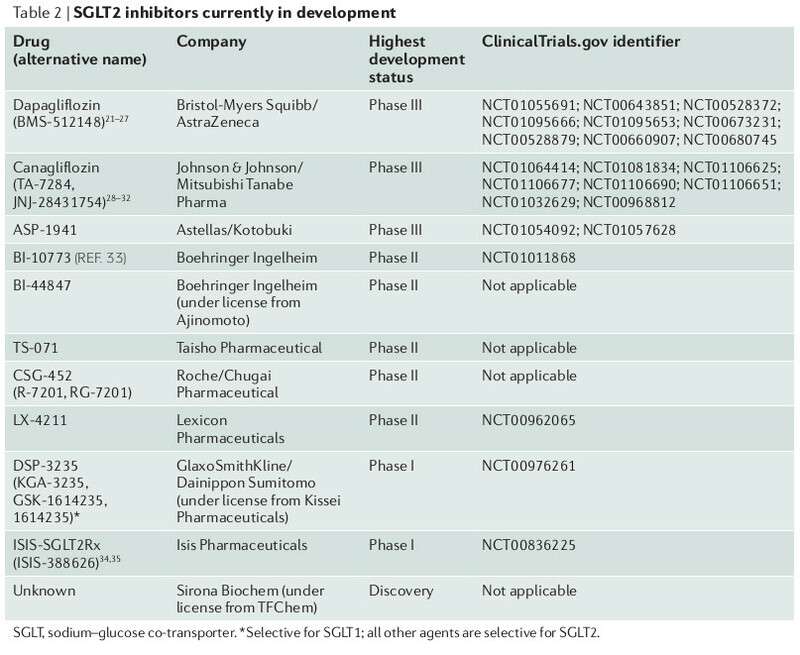 Table below gives an overview of the SGLT2 inhibotors in development. In summary, increasing urinary glucose excretion represents a new approach to addressing the challenge of hyperglycaemia. SGLT2 inhibitors may have indications both in the prevention and treatment of T2DM, and perhaps T1DM, with a possible application in obesity. Further studies in large numbers of human subjects are necessary to delineate efficacy, safety and how to most effectively use these agents in the treatment of diabetes. Intensive blood-glucose control with sulphonylureas or insulin compared with conventional treatment and risk of complications in patients with type 2 diabetes (UKPDS 33). UK Prospective Diabetes Study (UKPDS) Group. Lancet 352, 837–853 (1998). Buse, J. B. et al. Effects of exenatide (exendin-4) on glycemic control over 30 weeks in sulfonylurea-treated patients with type 2 diabetes. Diabetes Care 27, 2628–2635 (2004). Inzucchi, S. E. Oral antihyperglycemic therapy for type 2 diabetes: scientific review. JAMA 287, 360–372 (2002). Brown, G. K. Glucose transporters: Structure, function and consequences of deficiency. Journal of Inherited Metabolic Disease 23, 237–246 (2000). Wright, E. M. Renal Na+-glucose cotransporters. Am J Physiol Renal Physiol 280, F10–F18 (2001). Chao, E. C. & Henry, R. R. SGLT2 inhibition — a novel strategy for diabetes treatment. Nature Reviews Drug Discovery 9, 551–559 (2010). Ferrannini, E. & Solini, A. SGLT2 inhibition in diabetes mellitus: rationale and clinical prospects. Nature Reviews Endocrinology 8, 495–502 (2012).